Its major export partners are Spain, France, and India. Its main exports are clothing and textiles, automobiles, and electric components. Its major import partners are Spain, France, and China. Its major imports include crude petroleum, textile fabric, telecommunications equipment, and wheat. Located in Northern Africa, Morocco has a 2,363.00 km border with Algeria (1,900 km), Western Sahara (444 km), Spain (Ceuta) (8 km), Spain (Melilla) (10.5 km). It has a 1,835.00 km coastline. Morocco claims and administers Western Sahara, whose sovereignty remains unresolved. Rabat is Morocco’s capital and the second largest city in the country. The city is located at the outlet of river Bou Regreg at the Atlantic Ocean. Rabat was founded in 1146 and served as a military fort. Rabat means stronghold of victory. The city covered an area of about 45.17 square miles and was made the capital of Morocco in 1912 during the French colonial rule. The population of the metropolitan area is around 1.2 million. Morocco is an African country covering 446,550.00 km2 of which 0.06% is water and 446,300.00 km2 is land. This makes it the 57th largest country in the world and slightly more than three times the size of New York; slightly larger than California. Its geographic coordinates are 32 00 N, 5 00 W and Rabat is the capital city. The English name "Morocco" comes from the Spanish and Portuguese names "Marruecos" and "Marrocos". Its ISO code is MA. Morocco has a mean elevation of 909 m above sea level. It has a Mediterranean climate with extreme temperatures in the interior. Its terrain is mountainous on the northern coast and interior with some large plateaus. Morocco has a population of 33,655,786 making it the 39th largest in the world. The highest populations can be found along the Atlantic and Mediterranean coasts. Arabic and Berber languages are official, while French is most commonly used. The major ethnic group reported is Arab-Berber. The majority of the population identifies as Muslim. The official languages of Morocco are modern standard Arabic and Amazigh Berber. The two languages have multiple local dialects which are widely spoken in different regions in the country. Apart from the two, other languages spoken in the country include Spanish, English, and French. The latter language is used in government offices and schools. The use of French in schools has promoted the use of the language greatly leading to a lot of Moroccans speaking French as a second language. Most Moroccans speak Arabic, but French comes second and is spoken by 33% of the population. Spanish and English follow at 21% and 14% respectively. Morocco is an independent country. It gained independence from France in 1956. Its constitution was last ratified in 1962. 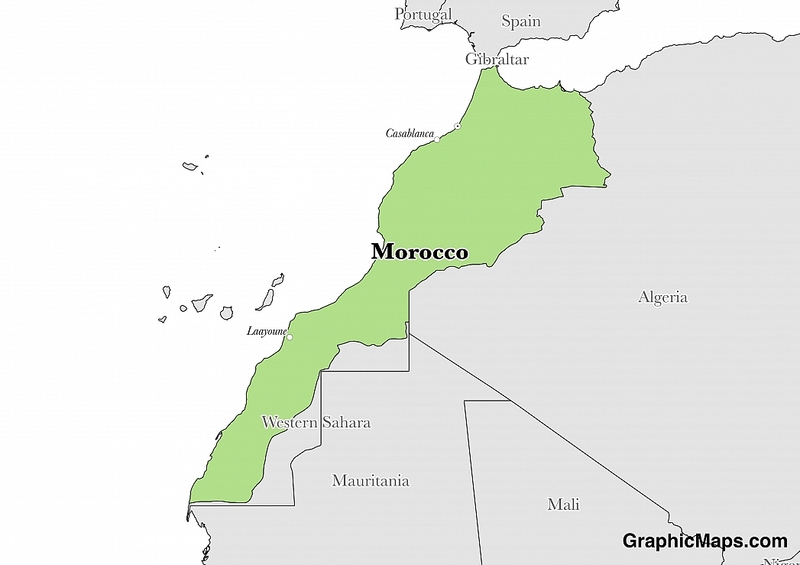 The kingdom of Morocco has a parliamentary constitutional monarchy system of government. The Moroccan government has a king, but does not wield absolute powers. The constitution of Morocco gives the king the power to appoint the prime minister to head the cabinet. Power in the government is further divided into the three arms of government, which include the judiciary, the legislature, and the executive. Morocco has had a multiparty system in place since the country got independence. Factoring in Purchasing Power Parity, Morocco's GDP is $283,000,000,000.00 (USD) with $8,400.00 (USD) per capita. This makes it the 58th largest economy and its citizens the 143rd richest in the world. The currency of Morocco is the Dirham (MAD). Its major export partners are Spain, France, and India. Its main exports are clothing and textiles, automobiles, and electric components. Its major import partners are Spain, France, and China. Its major imports include crude petroleum, textile fabric, telecommunications equipment, and wheat. Morocco's national flag features a red rectangle with a green pentagram in the middle. The pentagram has a black border. The flag was adopted as the national flag in 1915. During Spanish and French colonial rule, use of the Moroccan flag at sea was banned and the flag was re-established as the national flag in 1956 after independence. Red on the flag has widely been used in Morocco. It symbolizes the ancestry of the royal Alawite dynasty, thought to be descendants of Prophet Muhammad. Red also symbolizes valor, hardiness, bravery, and strength. Green depicts joy, love, peace, hope, and wisdom. Green is also the color of the Islam religion as Morocco is majorly an Islamic country. The pentagram depicts the seal of Solomon and it is a signet ring thought to have been given to King Solomon from heaven. Mulay Yusef designed the current national flag during his reign.